Easter is fast approaching. For some it is a deeply religious time and for others it’s a nice long weekend to relax and regroup, but for most, it is an opportunity to spend some quality time with your family and make some more memories with your kids. The excitement of family gatherings, chocolate, the Easter Bunny, Easter egg hunts, and other various Easter traditions, emanating from your children (and often adults too) adds to this special time of year. One way to add to the Easter festivities and get your kids involved in this holiday, is to do some Easter craft. I’m sure many families have made Easter hats for a parade, or bunny masks out of paper plates, and coloured or painted all the different types of egg patterns you could think of. 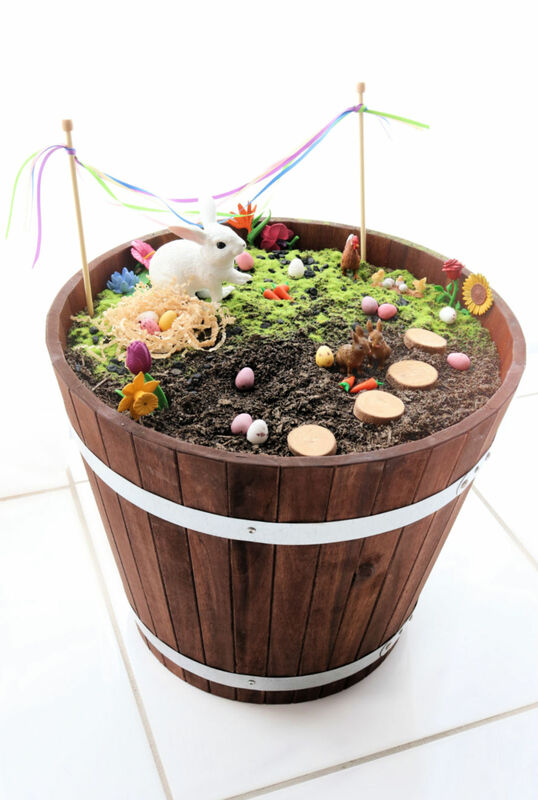 This year, try encouraging your kids to create their own Easter themed world using some of MiniZoo’s sweetest figures. MiniZoo figures: CollectA Rabbits, Safari White Bunny, CollectA Chicks Hatching, Schleich Hen, and Safari Flowers Toob. Firstly, you need to choose your surface – a play table is great, or even a large unused pot you might have outside works really well. I’ve filled mine with some regular garden soil to start with. I’ve then sprinkled some static grass on top of half of my soil (you can generally get this at your local craft store, but green split peas also look quite effective as a grass replacement). If you’re feeling extra crafty, you can also build your own landscape and scenery using various craft supplies (i.e. trees and bushes etc.) but for this scene I decided to keep it relatively simple with a few wooden rounds as stepping stones and a few black pebbles scattered throughout. Next, I placed my MiniZoo figures. Have a play with the arrangement, but don’t get too hung up on this if you intend your finished product to be played with – little hands may rearrange them several times a day. I intentionally chose the Safari White Bunny and the CollectA Rabbits, despite their size difference, as the Safari Bunny was to be my Easter Bunny and I loved that his stature, colour and pose made him stand out from the others. I personally couldn’t go past the CollectA Rabbits as brown bunnies are my daughter’s current favourite. 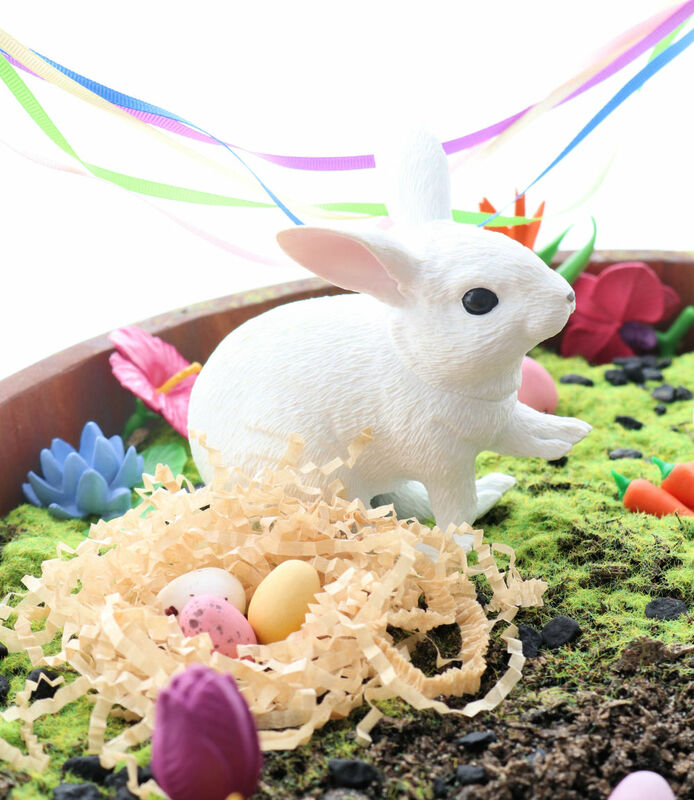 The Schleich Hen, CollectA Chicks Hatching and the Safari Flowers add to the garden theme and fit right into our Easter world. Of course, there are many other options on the MiniZoo website including rabbits and chickens from Bullyland, Mojo, Papo, Schleich, Safari, CollectA and Holztiger. I made some little clay carrots, to include with the rabbits, out of coloured polymer clay (found at my local craft store) but playdough would also work well. I also created a little ribbon garland to add to the Easter festivities using assorted ribbons and some wooden knitting needles, but wooden skewers would be an easy substitute. Some simple shredded paper/straw worked perfectly to construct a little nest for my scene. Last, but certainly not least, it’s time to add your chocolate eggs! I used Cadbury Mini Eggs because they have a crispy speckled shell and look more realistic, though wrapped eggs might be a better choice if they’re going to be sitting out for a while. Of course, add anything extra to make it your own and get your little ones to help make it extra special. In addition to creating your DIY Easter world, I know that some families prefer to avoid over-doing the chocolate at Easter time and would rather give gifts instead of chocolate eggs and bunnies. If this is the case for your family, MiniZoo figures are also the perfect non-chocolate Easter gift for your little ones. 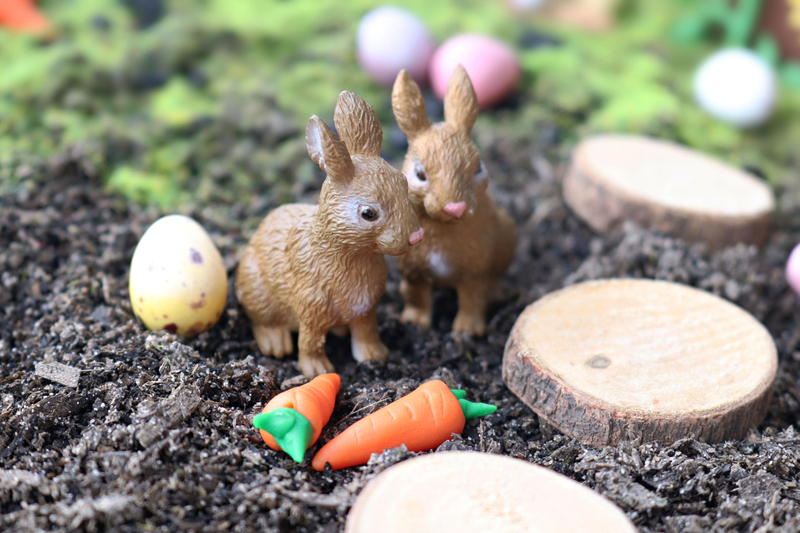 Check out MiniZoo’s website for the full collection of figures – there’s plenty more to choose from for your Easter themed scene. Also, if you want some more ideas to create your own worlds with your children, or have a closer look at MiniZoo products, see our Facebook, Instagram, YouTube and Pinterest accounts, plus, stay tuned for more DIY blogs down the track.